The introduction by Nintendo of the Wii Zapper and the Mario Kart Wheel at E3 today was great for gamers, but what struck me during its press conference was the fabled game company’s continued, relentless assault into our living rooms and turning everybody into gamers. In the first five months of 2007, the gaming market in the U.S. is up nearly 50 percent; about 42 percent in the U.K.; and a whopping 114 percent in Japan. Nintendo figures that 69 percent of the growth comes from Nintendo products, many of which are aimed at kids and, now, their parents, not just serious gamers. Where Nintendo continues to see growth isn’t in the coveted 18-to-24-year-old demographic but with young adults, moms, dads, even grandparents. Nintendo notes in Wii households that 3/4 of men 25-to-49 have tried the Wii and 1/3 play it regularly. Of men more than 50 years old, half have tried it and 1 in 8 play games daily. Ten percent of women over 50 report playing the Wii regularly. “Everybody is a gamer,” said a Nintendo spokesman. Not everybody. Not just yet. But it’s evident that Nintendo is making in roads through successful games such as Brain Age and they hope with the introduction of Wii Fit, which aims at improving the health of family members through active play first seen in Wii Sports. 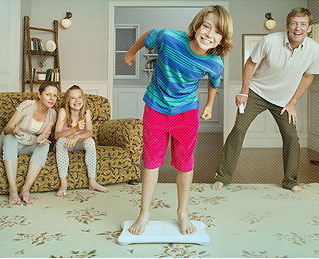 Wii Fit comes with a Balance Board (not the final product name) that assists with aerobic, toning, and balancing activities. Nintendo promotes communication between family members as everyone can review one another’s progress on a new channel on the Wii Menu, due out in the first half of 2008.